Virginia Gov. 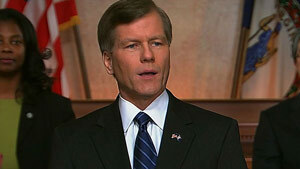 Bob McDonnell gave the GOP response to President Obama's State of the Union speech. (CNN) -- Virginia Gov. Bob McDonnell addressed the federal deficit, job growth and health care reform in the Republican response to President Obama's State of the Union address Wednesday night. In a speech that at times sought to reach common ground with the president, McDonnell, who took office on January 16, lauded Obama's announced freeze on discretionary spending and said he was encouraged by the president's promises on job creation. But he also called the current federal debt level "unsustainable," blaming Democratic policies for the deficit of more than $100,000 per household. He also said the nation's unemployment rate is "unacceptable." "Good government policy should spur economic growth, and strengthen the private sector's ability to create new jobs," he said. "We must enact policies that promote entrepreneurship and innovation, so America can better compete with the world. "What government should not do is pile on more taxation, regulation and litigation that kill jobs and hurt the middle class." He went on to say that "without reform, the excessive growth of government threatens our very liberty and prosperity." McDonnell also said that while Americans agree that an affordable, high-quality health care system is needed, most of them "do not want to turn over the best medical care system in the world to the federal government." "Republicans in Congress have offered legislation to reform health care, without shifting Medicaid costs to the states, without cutting Medicare, and without raising your taxes," he said. "We will do that by implementing common-sense reforms, like letting families and businesses buy health insurance policies across state lines, and ending frivolous lawsuits against doctors and hospitals that drive up the cost of your health care." McDonnell's speech before a friendly audience on the floor of the House of Delegates at the Virginia State Capitol praised Obama's stance on education and his recent decision to deploy 30,000 more troops to Afghanistan. "We agree that victory there is imperative for national security. But we have serious concerns over recent steps the administration has taken regarding suspected terrorists," he said, citing the decision to read the suspect in the Christmas Day attempted attack on a domestic airliner his Miranda rights. "As Senator-elect Scott Brown says, we should be spending taxpayer dollars to defeat terrorists, not to protect them," McDonnell said, referring to the newly elected Republican senator to Massachusetts who took the late Ted Kennedy's seat. McDonnell, 55, won the governor's office in a tough election battle last year against Democrat Creigh Deeds. He concluded his speech by calling on all Americans -- Democrats, Republicans and independents -- "to work together to leave this nation an even better place than we found it."